Whenever you need to reach out to multiple customers with an update, the process can get hectic. Manually creating tickets, on behalf of the client, sending emails from Gmail and having the answers picked up by Zendesk or exporting the database into third-party email clients is a lot of work. And a lot of time which could be spent doing other important activities. Fortunately, there is a shortcut! Are you sick and tired of an outdated default chat design? Our skin is a breath of fresh air for your team and your customers. Not only it gives you more freedom in choosing the look of the chat widget, but it also enables you to change the widget experience completely. Whenever you need to share some information just create a list, write your email and send it when ready! It’s as simple as that. Zendesk will create a new ticket for each email and track all replies. When you find an issue that can cause the support channels burst with tickets, be proactive! 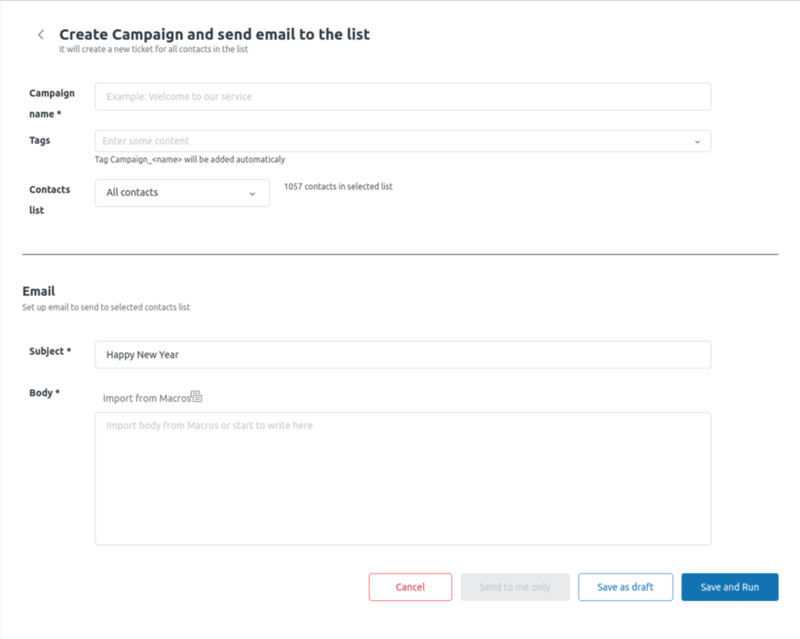 Use Proactive Campaign to target a specific list of contacts and prevent support issues as well as surprise your audience with attention to detail.